Planning a wedding abroad? One of the first things that I thought about when deciding on Santorini for our wedding was the heat. In case you hadn’t noticed from my various social media updates and blog posts in the last couple of days, me and heat don’t mix very well. To be fair, it’s worse at the moment because I’m pregnant and I *touch wood* won’t be next September when Ed and I get married overlooking this beautiful view.. This one wasn’t actually my decision. 6pm was suggested to us by our wedding coordinator and my inital reaction was hell no! I hated the idea of missing so many hours of our special day waiting for what is essentially the evening for anything to start. Then I thought logically. It’s going to be peak season out there. It’s likely to be over 30 degrees in the daytime. Do I really want us to be so sweaty and uncomfortable during our ceremony and celebrations that we won’t enjoy it? With our three kids to think about as well, I decided to listen to reason, and we’ve booked the 6pm ceremony. Ok so browsing Pinterest became my number one favourite thing to do after Ed and I decided on a destination wedding. I was pinning cool ideas left right and centre. One idea stuck out and that was giving guests fans to use during the ceremony. Something that can match the colour scheme, make for some cool photos and keep guests feeling less hot and bothered, what’s not to love? 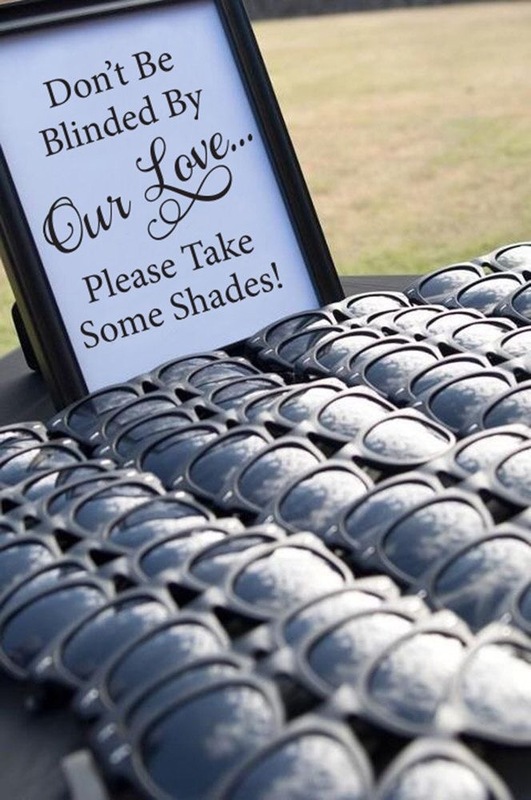 Yes, this is another Pinterest steal… And yes, guests are not likely to have forgotten to pack their own pair of sunnies, but think of the cute picture! I’m not going as far as providing sun cream for every guest, but I will have a bottle to hand, especially for the children as the sun will still be quite strong even in the early evening and I don’t want to risk them getting burnt. I will also be slathering this on the whole holiday to make sure I don’t end up resembling a tomato in our wedding shots. Hopefully *fingers crossed* it won’t rain out there.. But an umbrella works well as a source of shade too, plus again, think of the photo opportunities! Are you planning a wedding abroad? Or a summer wedding here in the UK? Do you have any other tips on keeping cool in the heat?